It's all over, says Roger Daltrey in There's No Music Industry Anymore, Why Would We Make an Album? The Who frontman says the internet has stolen the record industry and gives musicians no incentive to make new music. So, because of the Internet, Mr. Daltrey makes something less than millions in recording. I, on the other hand, make something more than zero. I am not crying Boo Who for Mr. Daltrey. If you think music was viable for just the 75 best years of records, then you're lazy. Choose better role models and mentors for your musical endeavors, like star recording engineer, Bobby Owsinski. He has a lot to tell you about what to do next in his book, Music 4.1: A Survival Guide for Making Music in the Internet Age. He gets on with business and thrives. ​So do I. I'm not quitting on albums. 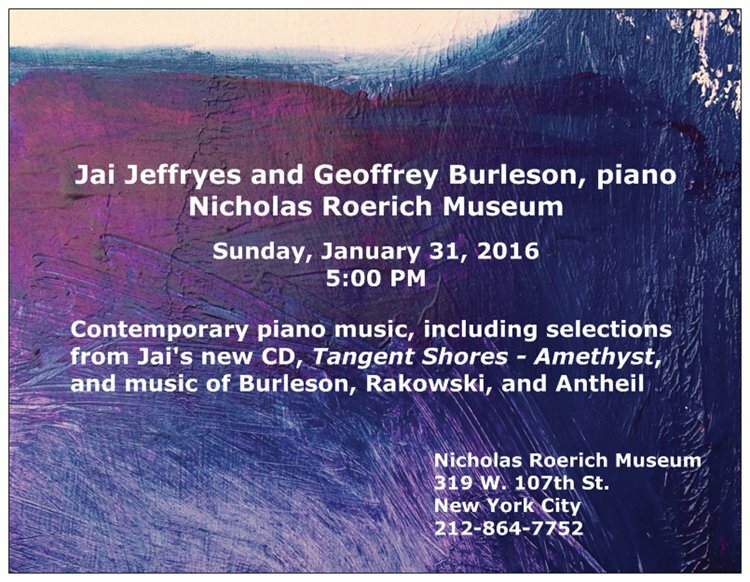 My newest is out on Composers Concordance Records, available from Naxos. ​One of the benefits of living in New York City is public transportation. I haven't needed to own a car in 25 years. No expense, no parking, no hassle. Still, I miss my cars. I used to be like a pet rescue shelter for cars. Since I had little money, I took over cars that other people couldn't deal with. I had to make them run so I could get to work. There was the pitiful, rusted out green Plymouth Duster I picked up for a few hundred dollars. It was all I could afford after a drunk driver totaled my Corolla parked in front of my apartment. The seller for the Duster said it wouldn't start. If I could get it to start and drive it off his yard, I could have it at a salvage price. So I did. There was the Chrysler Cordoba my Dad said was a lemon. He was so frustrated with it, he just gave it to me. I got it running and drove it home to Texas from Ohio. That car was gigantic. It had its own zip code. I measured its mileage in gallons per mile. I had to get to work, accompanying ballet classes, singing waiters, and college students. Maintenance of my cars was up to me. Uncertainty was expensive, what with break downs, tow trucks, and missed gigs. Mechanics were expensive, too, all the more so when they didn't even fix the problem. There was the time my car overheated and blew a head gasket. I think it cost me something like $600 for a mechanic to repair it. I drove it home and it overheated again. I walked to the library (there was no internet then) and learned my head gasket wasn't the problem, it was a consequence. Overheating blew it. My radiator was probably clogged. All you had to do find out was run the car for ten minutes and then carefully touch the fins to see if there was a cool spot. I did that and the cool spot in the center of my radiator was the size and shape of Nevada. I spent the afternoon removing it and a buddy drove me with it to a place that dunked it in acid and cleaned it out brand new. My car ran cooler than any cucumber after that and proved once again I was better off relying on my own education, motivation, and effectiveness. It was liberating. It was fun, too. I liked it because it was logical. For example, an engine needs three things to run, fuel-air mixture, compression, and spark. I could run down the chain of causality and figure out what was going on. The moment I opened the car door, the diagnosis began. If the dome light came on, there was electricity in the system. The constant attention cultivated relationships. I personified my cars. I never just drove anywhere. I went for a conversation. The car talked to me and I listened. I had to or I'd pay for it, like when we blew that head gasket. The road sound, the temperature, how the steering felt on a turn, the tire pressure, the color of the oil. I knew how my car felt at all times. I gave it what it needed, and when I did that, it did what it could for me. I had great affection for all of my cars. And they taught me a lot. They taught me why they failed (and this is how all things work, not just cars). There was only one reason ever, and that was a failure of my understanding. Concert attendance dwindling, audiences aging, orchestras going under. I see this question all the time. Can classical music be saved? I never hear this question. Can the Dutch Masters be saved? Why isn't anyone worried about Rembrandt? Because Rembrandt is taken care of. He doesn't need saving. He has his place in museums. His work is preserved. Anyone who wants the benefit of art from the past can find it. The work of the Dutch Masters is preserved and none of them are alive today, practicing their art, and in need of saving. Outside of the museum there is a whole world of artists creating and connecting today. Museums are fine and wonderful and important, for preservation. The world of the living is where creation resides. Creation is what we do now. On the other hand, preservation is what we do for those who once created, but create no more. I am, in part, a classical pianist. When I play the music of Chopin or Beethoven, I am preserving historic creations. I think it is important and beautiful to do that, just as I think it is important and beautiful to preserve art in museums. Nor is history preserved in a museum lifeless in spirit. The best art possesses a humanity that transcends time, and I strive for my musical preservations in performance and recording to connect as meaningfully to listening audiences as if they were viewing Vermeer in a museum. Meanwhile, I scale my expectations. Preservation is not mainstream. It isn't popular. 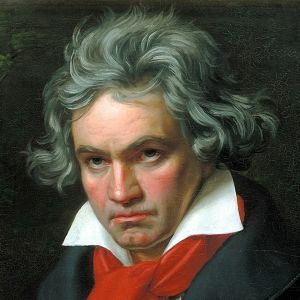 I don't expect it to be, since classical music is not the creation of the living. Haydn isn't meant to be mainstream again. He already was once before. He was popular and successful in his day. I don't expect him to remain so today. Classical music wasn't always classical music. It was once new music. It isn't now. The works I preserve as a classical musician aren't the works of the living. I don't feel slighted by audiences who identify primarily with art of today, created by artists of today, over art preserved from the past, and I don't strive to make classical music popular now. I try to make genuine, human connections with a segment of the music listening audience who want to connect with timeless values preserved from history, like in a fine museum. That segment of the music listening audience isn't going away, any more than the audience for classic portraiture is going away, but these are not growth industries. They are not supposed to be. The audience for musical preservation (AKA classical music) is a narrow segment, and I'm at peace with that. Yes, the best classical music should be preserved. No, classical music should not be saved, it isn't in peril and doesn't need it. New art from the living merits saving. 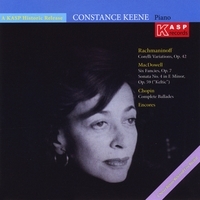 Donald Isler released a lovely recording of a recital performance by Constance Keene on his label, KASP Records. I ordered it a while back and just now got around to listening to it. Keene plays with very prominent melodic projection. It's quite nice to hear, and her performances of those old chestnuts, Chopin's Ballades, are definitive. There are some interesting, lesser known pieces to satisfy the curious, like several by MacDowell. But the highlight for me was Gluck's Melody from Orfeo, so lovely in a transcription by Abram Chasins to be worth the price of the CD all by itself. The way I learned how to cook was by committing to eating whatever I made. Every night I had dinner, I learned my lesson. You learn how to record the same way. Record every day. Commit to listening to it. You'll get it. For the same reason. I recently received an email asking about my availability to play a cocktail hour at the Pierre, an amazing, beautiful, luxurious hotel in New York. Now, I don't play those kinds of gigs. I'm not a cocktail pianist at all. The last time I played a club date was in college, when I still hadn't gotten the message that I'm not a jazz pianist. I mean, at all. But never say no to any gig! If you are already booked, or if you don't play that kind of gig, no matter what, the answer is always, "Thank you so much for getting in touch with me. I would love to refer you to my good friend, the splendid pianist, so-and-so." Never tell them their gig isn't what you do! You might change your mind later, or you might study hard and become brilliant at it. Or maybe you'll never do it, but meanwhile you can use the opportunity to refer a friend who fits better and could use the work. Keep musicians working! You're part of the community. Yes, you compete, but you can be a colleague, too. Not only are you helping your colleagues, but those gestures come back to you, too. I worked in music theater for 10 years. I had a grand time and I was always busy. My first job was in a dinner theater. The way you break into Broadway show pit orchestras is by getting on the list of substitutes for players with jobs already. They pick qualified colleagues. Now my dinner theater job wasn't exactly a plum job, but it was respectable, steady work and it made me a MIDI expert. I used it as a networking opportunity. If I took off a show, I called all the best Broadway players who already had jobs. I once even called the original conductor of Annie. I knew they were all already working and none would be available to come do a dinner theater gig for one night, but they referred me to others who were and moreover they came to know me as somebody with something to offer instead of someone with something to take. I got tons of referrals in turn and spent a decade living mostly on the road with Broadway shows. It was fabulous. In order to refer a cocktail pianist for the Pierre, I called friends I know and I posted on social media. 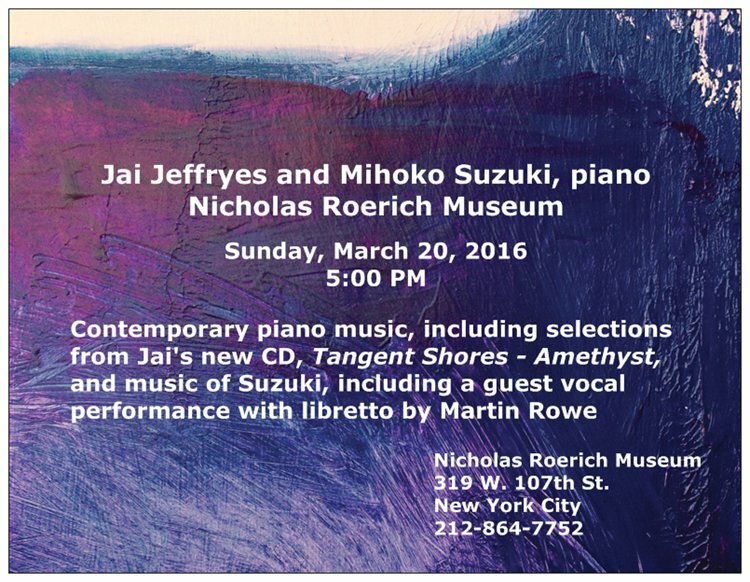 I even called one prominent pianist who I was sure wouldn't want this kind of gig. He has been the pianist for an illustrious singer I won't name here, but we're talking living legend and Grammy winner. Another young jazz pianist friend responded to me on Facebook Messenger within minutes. I made the referral to the event planner and not only did my pal get the gig, he upsold the event planner his trio, creating work for his two sidemen, too. How smart, savvy, and cool is that? Incidentally, the famous pianist for the singing legend did call me back, and what do you know, he wanted the gig but it was already hired. Why? Because the guy that got the job alerted me immediately with Facebook Messenger. I remember when I got my first answering machine. Then I got one you could call into to retrieve messages. In the 90s, I got a pager. Always the hacker, I rigged my answering machine to page me the very moment anyone left a message. I never missed a gig call. When someone is hiring, they go down the list until someone picks up, just like I was doing for this Pierre job. The old-school guy with Grammies didn't win the Pierre. The kid with a smart phone and Facebook Messenger did. I think that is so cool, and it is another lesson to add as a postscript to this story. When I was a kid I used the money I won in a piano competition to buy a short wave radio. I was fascinated by broadcasts coming from all over the world. I kept checking out of the library The World Radio and TV Guide and logging what I was hearing so that I could see where all of these broadcasts were coming from. Is it any surprise that the geeky adult is now fascinated with tracking things on the internet? The first thing to go into any website I build (including this one, Jeffryes.NET) is integration with Google Analytics. It's fun to see how many visits I receive and where in the world they're coming from. For example, in the last 6 months I've had visits from every state of the U.S. Except for one. Montana. Now what's up with Montana? It turns me into George Costanza. In one episode of Seinfeld, George is so obsessed with a woman who dislikes him he neglects even his own girlfriend, who does like him. All I can think about is, what's up with Montana? So here's the deal. I will send a free copy of my debut CD, Hayner Resounding, to the first three people from Montana who visit my website, Jeffryes.NET, find the Contact page, and request the CD and my newsletter. I don't spam people with my newsletter. I only send it to people who ask for it and anyone can unsubscribe any time, no tricks or hard feelings. If you want Hayner Resounding for free, bless you, and please accept the newsletter, too. If you get the CD and unsubscribe from the newsletter later, it's just okay! If I have already given away the three CDs, I will still add you to the newsletter, and you will still get one free track from the CD, which I give to all newsletter subscribers in any case. If you don't want the newsletter without the whole CD, you may tell me in advance. That's fine. And you may always unsubscribe later. I only ever visited Montana once. During my show business days I played Billings on a bus-and-truck tour of Jesus Christ Superstar with Ted Neeley. Sleeping on a bus without bunks every night leaves you in a daze and I don't remember anything about it except there was lots of space! Now wouldn't it be nice if my new friends in Montana wanted me to head on over for a series of library or house concerts? While I'm obsessing over Google Analytics, here is another sample track from Hayner Resounding, Mouvement, from Debussy's Images, Book 1. I have an open call for scores and the music is pouring into my email in a flood. It is amazing to see the abundance of creativity, and humbling that so many composers are ready to send me their work in hope that I will perform it and produce a recording. Clearly, I should have done this a long time ago. The wealth of music awaiting a performer's realization is incalculable. I want to give everyone who has submitted work to me the serious consideration they deserve, but it will take me quite some time! Given the abundance of feedback I have received on this project, the possibilities extend far beyond producing one CD. Expect a new website featuring the composers who have extended themselves to me.